You’ve lifted heads of state, celebrities, community leaders, athletes and musicians overhead—physically. What on earth would you lift next? How about the world’s tallest horse? And the world’s smallest. Within the space of a single month. For 75 year old New York based weight-lifter, humanitarian and world harmony leader Sri Chinmoy, the journey from smallest to tallest was a perhaps predictable giant leap—or lift—forward, in a lifetime full of them; he has made a practise, art form even of lifting people, unusual objects and animals overhead; a novel, inspiring twist to the normally mundane activity of raising weights into the air. 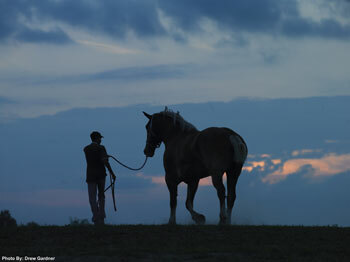 Officially recognised by Guinness Records, 9 year old Radar is a Belgian Draft Horse taller than any other—a towering 2 metres at the withers (shoulders), and at 1152kg, as heavy as a small car (airbags not included). On June 29th, together with handler Charles Wood, Radar grew even taller, lifted by Sri Chinmoy on a specially constructed, perhaps not correctly titled, calf-raise apparatus—a remarkable total of 1345kg lifted by steely septuagenarian calves above grass and meadow. 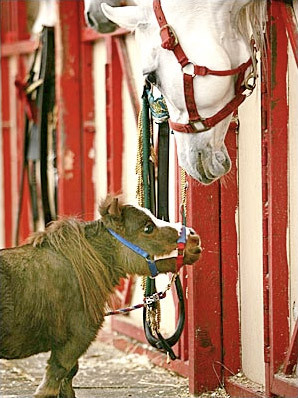 At only 25kg and 44.5cm tall, chestnut mare Thumbelina is barely the weight of a toy car, and about the size of an average dog, but she is a record holder as well—a dwarf miniature horse officially the world’s smallest. No mere mare, Thumbelina is more important than diminutive stature suggests—namesake and inspiration for the Thumbelina Children’s Society, raising money and awareness for children in need around the world. On May 31st, Sri Chinmoy raised Thumbelina, together with owner Michael Goessling and handler Tago De Pietro, on a specially constructed, seated calf-raise machine—their combined weight a not insignificant 257kg. Founder of the global The Oneness-Heart-Tears and Smiles humanitarian organisation, Sri Chinmoy awarded the tiny horse the Lifting Up the World With a Oneness-Heart award in recognition of her tireless strides to aid children. The award, where recipients are honoured by being physically lifted overhead by this weightlifting and fitness advocate, has previously been given to 8,000 people. And now one very small horse. The quite possibly tireless Sri Chinmoy also lifted 58 white wind horses in Mongolia this May, a display of strength intended to draw attention to the plight of an endangered species also a national symbol of inner strength and spirit. Just to let you know that your link to Lifting Up the World includes the prefix of your own site so it is a broken link. I figured you would just keep that comment private about the link so now I must also tell you that I enjoyed this article and recommended that people read it in my blog entry on the same topic – namely how Radar and Thumbelina just met for the first time. I’ve been following Thumbelina in the news with a Google Alert that keyed me in to her encounter with Radar. Hi Sharani—thanks for the mention in your blog. I’ve already read it in fact, and even left a comment. I track many blogs via RSS, and saw your update earlier today.